Abraham Mintchine was born in Kiev, Russia in 1898. He was an apprentice engraver at the age of thirteen and afterwards studied painting at the art college in Kiev from 1914. He was active in Moscow until 1923. In 1922 he exhibited in the First Russian Art Exhibition in Berlin, where he lived between 1923 and 1926, exhibiting a number of Cubist-influenced paintings in 1925, and designing sets and costumes for the Jewish theatre in Palestine. In 1926, penniless, he moved to Paris, mixing with the École de Paris circle including Soutine, Krémègne, Kikoïne and others. 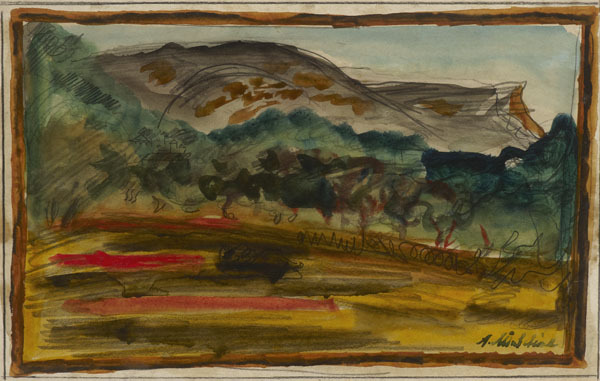 His pre-1926 work has disappeared, so that all his surviving work, including this loosely-handled watercolour landscape, dates from his last six years (1926–31). His first one-man exhibition took place at the Galerie Alice Manteau, Paris, in 1929. He worked frequently in Provence, especially from 1929 onwards, in contact with Othon Friesz. He died at La Garde, near Toulon, in 1931.